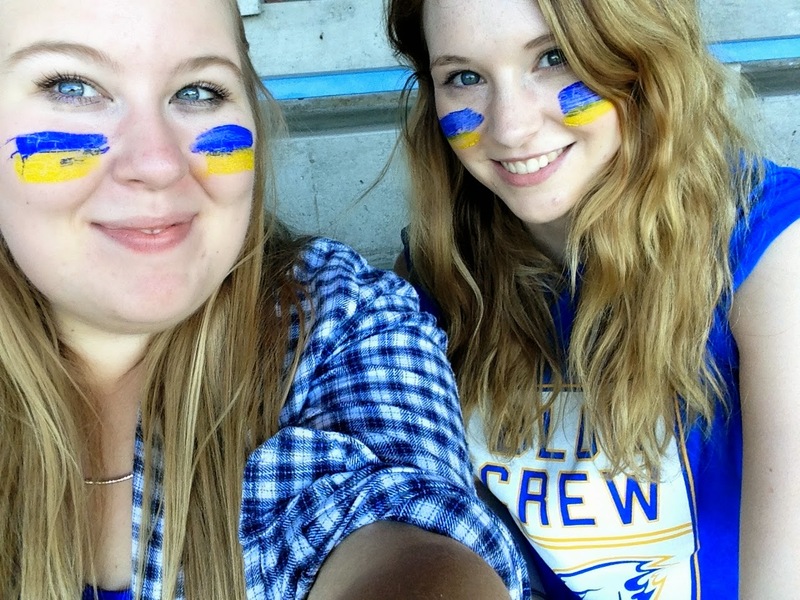 On Saturday it was Homecoming at UBC and even though I had two reports to do (and now another two - yay!) and lots of work to do I took the day off and went to support the Thunderbirds in their first football game of the season. Just saying, we lost 11 to 59 (or something like that). 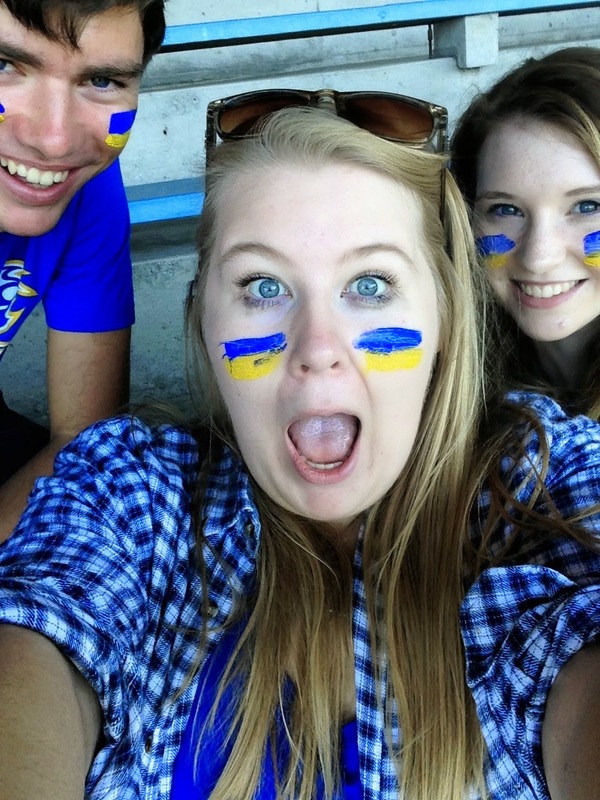 I think my T-Bird spirit is pretty low now - but it was a fun day! We started the day by doing some sort of trek from central campus to the stadium. People were constantly chanting and high-fiving and it was just so strange! We got our faces painted and followed the flag and the mascot (who made the day - really! I have a new respect for mascots) towards the stadium. I spent the whole journey going 'I DON'T UNDERSTAND - WHAT IS THIS?' but, I'm not going to lie, it was such a laugh! Oh, and how amazing is the swagon wagon? After paying $2 for a ticket (I know - breaking the bank right!? ), we went to the stadium and got some free stuff. The Nestea mango green tea is amazing and I need some more in my life. It was absolutely hilarious watching the game because I had no clue what was going on. Apparently there is an attack and defence team and the ball isn't allowed to touch the floor. That sounds more like a drinking game to me but I got the hang of it towards the end of the game (haha, not!). I could not help but get so into it though - when the T-Birds did well everyone was cheering and clapping and the marching band were playing and it was just like in the movies. All I needed was for Austin Ames (or Chad Michael Murray - either one) to come running towards me and for it to start pouring with rain. Sadly, that didn't happen but I did throw a lot of popcorn at Will so that kind of made up for it. Okay, it really didn't but it was fun managing to almost get it in his ear. Oh, and I still cannot get over the game being called 'football'. I don't think I saw the ball kicked once. It should be called 'jump on people and try and hit spectators in the face' or something. I am very surprised I wasn't hit in the head (and very grateful). We couldn't resist climbing on the new sculpture put on campus last week. I literally need a step to sit on it (I will find a portable one) but I love this photo. It's still so crazy to think I'm living here in Canada and it STILL hasn't sunk in. Just how?! So that was Homecoming! It was a completely surreal experience and I'm so glad I finally got to go to. I think it is one of the most movie-ish moments of my life. Now I have the experience does that mean I can be cast in a film? Please? You had fun there! Glad to see all of it! Ooh I feel for you not having your Austen Ames moment. Lovely photos, I'm so jealous. It kills me - why couldn't it have happened? I suppose with it being 28 degrees and all it wasn't the right weather anyway. Maybe I'll be luckier at my first ice hockey game haha!